PITTSBURGH—A new four-year, $7 million educational initiative by Carnegie Mellon University will leverage students' innate interest in robots and other forms of "hard fun" to increase U.S. enrollments in computer science and steer more young people into scientific and technological careers. The initiative, called Fostering Innovation through Robotics Exploration (FIRE), is sponsored by the Defense Advanced Research Projects Agency (DARPA) and designed to reverse a significant national decline in the number of college students majoring in computer science, science, technology, engineering and mathematics (CS-STEM). FIRE will develop new tools that enable middle and high school students to expand upon their interest in robots, leading them from one CS-STEM activity to the next. Examples are programming tools that create game-like virtual worlds where robot programs can be tested, as well as computerized tutors that teach mathematics and computer science in the context of robotics. The initiative will target robotic competitions such as FIRST, VEX and Robofest that already are popular among secondary school students, but also will create new competitions for autonomous, multi-robot teams and for computer animations that will attract a broader array of students and offer new challenges. "The idea is that these programs must be rigorous, but fun — what we call 'hard fun,'" said Robin Shoop, director of FIRE and of Carnegie Mellon's Robotics Academy, an international leader in the development of K-12 robotic education curriculum. "Robots provide a great teaching tool. Kids like robots and are innately curious about how they work and how they make decisions. Finding answers to their questions is fun, but technically challenging, and that makes robotics uniquely suited to teaching students computer science, engineering and mathematics." For more information and to register to receive updates for this project visit www.fire.cs.cmu.edu. The number of U.S. college graduates with CS-STEM degrees is declining, raising concerns about national competitiveness. The trend is particularly pronounced in computer science, where the number of graduates dropped 43 percent from 2004 to 2007 and where women and minorities remain underrepresented. "We have a significant decline in the number of students signing up for computer science, science, technology, engineering, and mathematics majors at the college level," said Melanie Dumas, DARPA's program manager for its CS-STEM Education Program. "The CS-STEM Education Program will help fill the talent pipeline and enable our nation to compete on the international stage." Since 2000, the Robotics Academy, part of Carnegie Mellon's Robotics Institute, has developed techniques and tools to help K-12 teachers use robots to teach science and mathematics and has trained thousands of teachers on how to incorporate robotics into their lessons. The academy will play a central role in FIRE, but the project also will draw on expertise from across Carnegie Mellon's renowned School of Computer Science. Ken Koedinger, Albert Corbett and their colleagues in the Human-Computer Interaction Institute (HCII), for instance, will develop automated tutoring systems for teaching Robotics Academy courses. "Cognitive tutors" developed at Carnegie Mellon already are used by hundreds of thousands of students each year to learn algebra and other traditional subjects. The computerized tutors present lessons and problem sets, provide step-by-step guidance with complex problem solving and adjust the lessons to each student's comprehension level. FIRE's cognitive tutors will assist teachers and mentors who coach in robot competitions but may lack the mathematics and programming background necessary to help students tackle increasingly harder challenges. Likewise, Wanda Dann and her colleagues in HCII's Alice Project will work with FIRE to create an Alice Animation Competition designed to increase the number of girls engaged in computer science. Alice (www.alice.org) is a software environment that enables novices to create 3-D computer animations and, in the process, teaches basic programming principles. Animation contests that use Alice or other types of animation software can appeal to students of both sexes who might not be interested in robots. The Alice team will collaborate with the Robotics Academy to add virtual worlds to ROBOTC, a programming language developed by the academy that works with many of the educational robotic platforms used in robot competitions. "This new ROBOTC capability will allow students to design and test robots in a virtual environment when it would be impractical to do so with a physical robot. We plan to add other programming languages as the project evolves," Shoop said. Manuela Veloso, professor of computer science and president-elect of the Association for the Advancement of Artificial Intelligence, and Howie Choset, associate professor of robotics, will develop new teaching tools and a new competition for teams of robots working cooperatively. "In the future, robots will work in teams, not as single robots," Veloso said. "If we want to drive future innovation, then we need to begin to challenge students to solve multi-robot problems today." To further expand the potential pool of CS-STEM students, Lori Levin, associate research professor in the Language Technologies Institute, will work with FIRE to increase participation in the North American Computational Linguistics Olympiad (NACLO), www.naclo.cs.cmu.edu/. The International Linguistics Olympiad is very popular in Europe; FIRE's goal is to make it accessible to thousands of students across the U.S. In addition to creating new competitions, FIRE will reach out to national organizations such as the Girl and Boy Scouts, 4H, and the Boys and Girls Clubs of America to engage more students in activities that prepare them to be future innovators. "Tens of thousands of students nationwide participate in robotic activities every year, but these activities do not always translate into increases in academic preparation or sustained engagement with CS-STEM," Shoop said. "FIRE will provide the infrastructure, the tools, and the resources to significantly engage students for the long term." Christopher Schunn and his colleagues at the University of Pittsburgh's Learning Research and Development Center will provide a key component for the project, evaluating the educational effectiveness of FIRE's tools and methods and monitor outreach efforts to communities across the country. 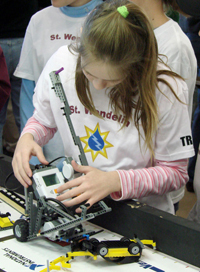 Pictured above, a student competes in the FIRST Lego League.